It is no coincidence that the spice drawer in my kitchen is the biggest and sits just to the left of my stovetop. Upon opening it to consider my options for the meal I am cooking up, I wonder if this is how a kid standing in front of a candy-store window feels. My taste buds are already responding in anticipation of the possibility of flavors that I see before me. The oil already hot in my pan, I go for those whose positioning I know well: ground cumin, homemade garam masala, and a liberal amount of cayenne. Like the bug-eyed, drooling kid before the storefront, I want it all but always fall back on my favorites. For the kid in me, it is all about satisfying my craving, but is it time to apply a pun in poor taste? Is variety the spice of life, or is it the variety in our spices that help sustain life well? It is estimated that prehistoric man regularly ate a wide variety of plants (to include in excess of 1000 different plants). Today, the average American eats roughly 20 different plant foods on a consistent basis. It is difficult to determine just how Jane and Joe Cro-Magnon's lives were enhanced by this variety or how their health fared as a result of it, but there is no arguing that the health of the average American today tends to rank as fair to poor. While the variables that affect ones health are numerous and at times difficult to track, there does seem to be some innate wisdom to the idea that choosing many different plant types increases one's chances of being exposed to some powerful compounds. Research is increasingly supporting that spices (typically, the dried aromatic parts of plantsgenerally the seeds, berries, roots, pods, and sometimes leaves) are an opportunity to significantly increase this variety and reap the potential health benefits of: increased immune system functioning (common colds, bacterial infection, allergies); decreased inflammation (arthritis, bursitis, tendonitis, and even heart disease); the enhancement of detoxification of enzymes and steroid metabolism; as well as antifungal and antibacterial effects. The term antioxidant has become one of the nutrition buzzwords of the last few years. In simplified terms, an antioxidant is a chemical that prevents the oxidation/oxidization ("good" for the break down of sewage; potentially "bad" in the body) of other chemicals. These oxidized chemicals that result are called free radicals and they can be damaging to the body's cells. If present, antioxidants can scavenge for free radicals, or "molecular garbage", and minimize their deleterious effects. Because oxidation is being cited as a precursor to our nation's most heavy-hitting diseases, heart disease and certain cancers, the findings on spices are exciting. 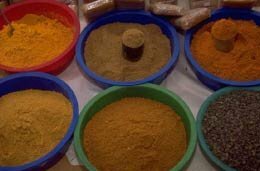 Although still in the initial stages, researchers are unveiling increasing support for a positive relationship between spices like those found abundantly in Indian cuisine and both the prevention and treatment of digestive-system cancers. Specifically, ginger and capsaicin, a pungent ingredient of hot chili pepper, have been shown in experimental lab tests to protect against experimentally induced mutagenesis and tumorigenesis. Curcumin, the active ingredient of the spice turmeric is reportedly several times more potent than vitamin E as a free radical scavenger and exhibits strong anti-tumor, antioxidant, and anti-inflammatory activity. The most recent approach to heart disease is viewing it as an inflammatory condition, and the aforementioned spices show great promise as delivering COX 2 inhibiting compounds, those responsible for painful and debilitating symptoms. Cumin, used in both Indian and Mexican foods and combining black pepper with turmeric have been cited as effective pain relievers and anti-inflammatories for painful joint conditions and even headaches. Since recent evidence supports the role of cyclooxygenase (COX) inhibitors with reduced risk of several cancers as well as being effective in inflammatory conditions, there is little doubt that the benefits of antioxidants may be wide-ranging. While the verdict is still out as to the most beneficial antioxidant and as to the optimal amount for results, embracing a cuisine rich in spice, as well as in fruit and vegetables, may further enhance the disease preventive capacity of one’s diet. At the very least it will give your taste buds a treat, adding just the right amount of spice to your menu... and your life. Garam Masala (Hindi for "warm spice mixture") is a blending of sometimes dozens of spices and is often used in Indian cooking. It is great sprinkled on popcorn, pasta, rice, roasted potatoes and any other vegetables. Simple dry roast or lightly toast and mill the following ingredients together. If you happen to be among those who have a limited tolerance for some of these "hotter" spices or are not particularly fond of the flavoring they impart, those associated with other ethnic cooking show similarly promising roles as antioxidants. Rosemary, basil, sage, thyme, summer savory, and marjoram all make wonderful flavor additions to more Italian or French-based dishes.